I have been trying to write this review for a while because it is so hard to put this book and how I feel about it into words. I've spent a lot of time thinking about what to write in this review because honestly my review will never be able to do this book justice. It is that good. This is a very needed addition to young adult literature. This book is real. There are not enough books out there in young adult today that are very real. A lot of books about teens are over dramatic, glamorized, and don't honestly document the teen experience. Albertalli is able to document the teen experience perfectly with the topics she writes about and how the story is written. The events happening, the emotions, the dialogue, and the interactions were 100% teen authentic. This led me to feel more of a connection with the book because I could see these characters and these events in the hallways at my own school. Simon and Blue are one of the most adorable couples I have read about in a while. Even though you don't get to see them together in person till the end of the book you are able to see their relationship through their emails that appear about every other chapter. You were able to read their conversations and see their chemistry build. This is couple you will definitely be rooting for! The characters were excellent. Albertalli created characters that had all different types of personalities making it more relatable. You also get to see a sub plot of friendship dynamics which I enjoyed. 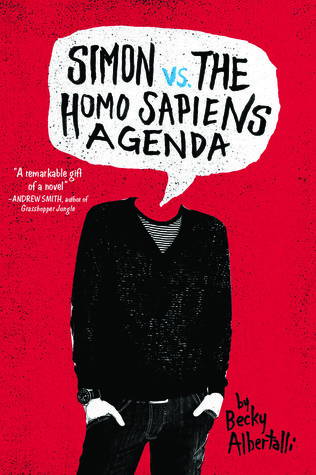 The absolute stand out for this book though was Simon. Simon is probably one of my all time favorite characters. He was a real teenager, falling in love for the first time while trying to figure out his identity. Simon is funny, kind, and you just want to be his best friend. Simon impacted me so much and I can't even begin to imagine what he can do for someone going through the same situation as him. Simon was the type of character that you get so connected with and invested in that you feel what he feels. The whole story when Simon hurt I hurt, when he had hope I was bursting with hope for him, and when good things happened for him I was giddy as can be and smiling till it hurt. Simon is a character you cannot help root for. This book is a phenomenal read that young adults have been waiting for. I honestly can't even begin to put into words how special this book is. Trust me when I say you need to pick this up and read it, no matter what. This is a coming of age story you do not want to miss. Albertalli is an author to watch and I cannot wait to see what comes next from her. Go buy Simon now! You have to!